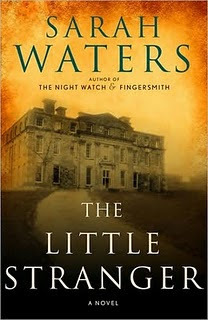 The Little Stranger by Sarah Waters is a haunted house story told by a man of science who doesn’t believe in ghosts. The reader is left to believe or not, based on evidence that unhinges other characters. Set in post World War II rural England, class boundaries are crumbling like the mansion’s foundation. Dr. Faraday’s mother was once a nanny at Hundreds Hall. He had visited the grand estate as a child and had broken off a decorative acorn from the molding. Even as a boy, he wanted to possess something above him. Now a village doctor, he returns on a medical visit and finds the once stately mansion in poor repair. The Ayres family cannot afford to maintain Hundreds Hall, although they still employ two domestic servants. The house was occupied by British forces and then left to neglect. The Ayres son was crippled as a wartime pilot; the mother is an aging widow, and the daughter, Caroline, is too plain to marry well. In desperation, they turn to lonely Dr. Farraday for emotional support. The old aristocratic order is what is truly haunting the narrative. Caroline’s hands are ruined from helping out in the kitchen and on the farm, although she doesn’t mind. Ironically, it is Dr. Farraday who is disgusted by Caroline’s lack of upper class grace as much as he admires her strength. Sarah Water’s attention to social class and to the subtle nuances of character bring to mind Evelyn Waugh or a dark P.G. Wodehouse. Her writing is beautiful and understated; it fits the era. If you enjoy visiting National Trust Houses or just like an old fashioned ghost story, you’ll love this multi-layered novel. British book blogger dovegreyreader called The Little Stranger one of the best books of 2009. It was short listed for the Man Booker Prize. 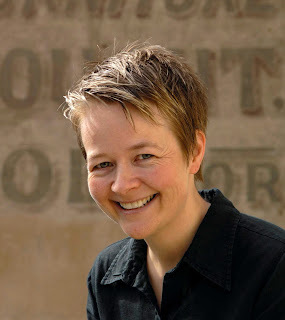 Sarah Waters blends a scholar’s knowledge of period detail with a novelist’s eye for drama. The narrative drags a bit in the middle, but keep reading. The story builds gradually and will haunt you even after you finish. Why did you choose the 1940's as the time period for The Little Stranger? My previous book, The Night Watch, was also set in the 1940s: I finished that novel still really interested in the period; still with things I wanted to explore. In particular, I was fascinated by what had happened to the British class system in the 1940s. It was a time of huge change - a time of new opportunities for the working classes, but a scary time for conservative people, who saw old British hierarchies slipping away. It was that tension and turmoil that I wanted to dramatise. A haunted house story struck me as a good way to do it. Was Hundreds Hall based on a real house(s), and how did you build it? Hundreds Hall isn't based on any actual house, but while I was writing the book I tried to visit as many grand old country houses as I could, and I think Hundreds is in some ways a collage of bits of them all. I collected images, too, and drew plans, until I had quite a strong visual sense of the house. I tried to bring it to life for the reader by thinking about detail - the worn bricks, the uneven old window-glass, the scents of the house, the feel of light and shadow inside it - things like that. Did writing in a male voice present new challenges? Yes and no. I definitely had to make an effort now and then, to think about how a man would react, the kinds of things he might notice, etc. But then, you always have to do that with a character, regardless of their gender. You always have to make an imaginative leap into your narrator's mind - that's part of your job. So, ultimately, writing a male voice didn't feel as much of an issue as I had expected. Do you believe in ghosts/paranormal phenomena? Well, I don't disbelieve in them. I've never had a supernatural experience myself, but I love the idea of the paranormal - I think it makes life more interesting. I'm always fascinated to hear other people's stories; and I really enjoyed writing the spooky scenes in The Little Stranger. I'd like to write another ghost story some time - perhaps one with a contemporary setting. That would be a good challenge. Was there a special book that made you want to become a novelist too? Philippa Gregory's first novel, Wideacre, made a huge impact on me when I first read it, about fifteen years ago. It's a really brilliant novel - wildly melodramatic, but also fantastically clever about history, women and power. It got me thinking about historical fiction and what the genre can achieve; that prompted me to return to university and do a PhD, which in turn led to me starting to write historical novels of my own. When I was writing my first novel, Tipping the Velvet, I got a bit stuck. My friend Sally, to console me, said: "Look, it would be a miracle if you just sat down and wrote a perfect novel, from start to finish" - and I realised that she was right. No-one is capable of writing a perfect first draft; most of writing is actually rewriting. A book needs energy, time, and above all patience. I still remember Sally's comment when I get stuck, and it still reassures me. Reviewer's Disclaimer and Photos: my agent, Jean Naggar, sold the U.S. rights for The Little Stranger. I bought the book without compensation. 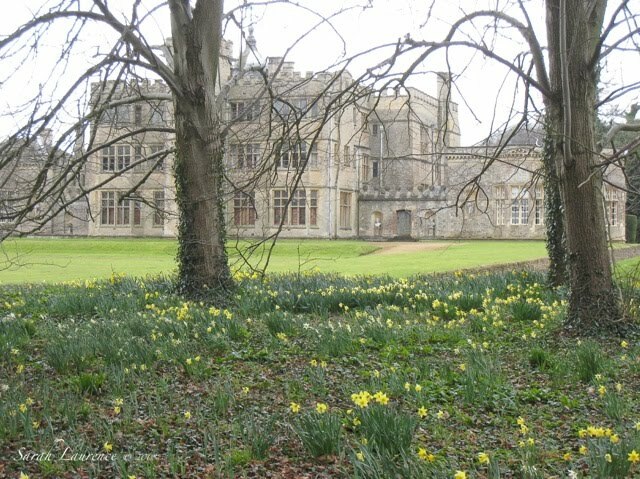 Photos are of Rousham House and Gardens and of the St. Martin Church, Bladon where Winston Churchill was buried. 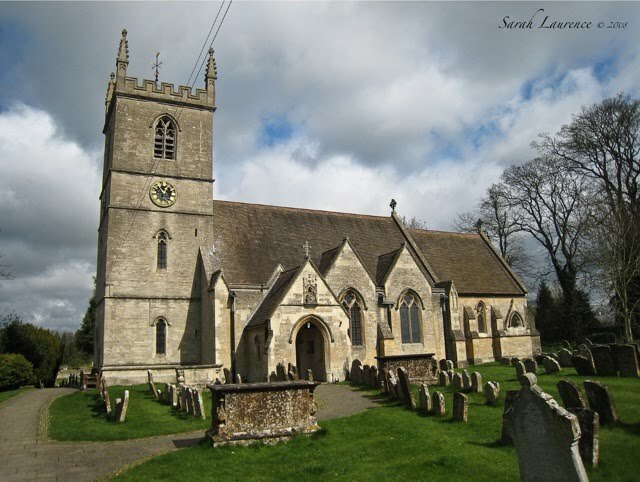 I took the photos during my sabbatical in England. Sarah: A great review that tempts me to purchase the book - although I think I would be tempted to read her "Fingersmith" first. I have often picked up her books in bookstores and considered buying them, but in the end I never did. Loved the interview as well - Sarah Waters is an intriguing woman. 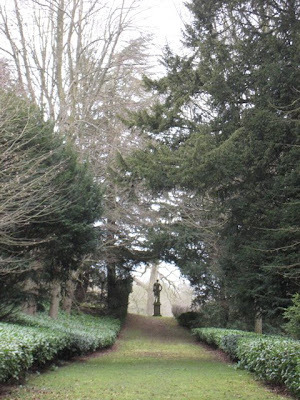 Your photographs are the perfect complement for your review and I especially like the one of the path leading to the statue. 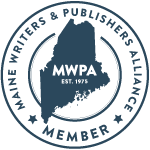 Your interviews with authors are such a helpful tool for aspiring writers, especially when the creative process is talked about. Hundreds Hall looks magical. Such an intriguing book and interview. The photos give us a sense of mood and setting, too. I especially like the advice that writing a book requires patience. I think we all get impatient with the process and anxious to finish, which clearly isn't helpful to storytelling. Dear Sarah, I cannot now imagine my life before I discovered your weblog for each posting brings a new dimension to my reading as well as an insight into something about which, perhaps, I had thought too little or, worse, not at all. I know of Sarah Waters' work from 'Tipping the Velvet' so was most interested to read your interview with her. It is always of interest to know from what sources a novelist acquires ideas, inspiration and material and, indeed, what prompts the individual to write in the first place. I cannot now wait to read her latest novel about which you have written such an enticing review for it appears to contain so many elements in which I am interested: country houses, gardens, the decline of the class system, the changing social order, etc. It was a boast of my grandmother that she was able to keep maids in uniform right up until the early 1950s!! Way before your time I suspect, and Sarah Waters',but in the 1970s Roy Strong, then newly appointed as Director of The Victoria and Albert Museum, staged an exhibition 'The Destruction of the Country House' which had a profound effect on people's views of the future of 'stately homes'. It was generally recognised at the time to be a triumph and even forty years later is remembered still. Bonnie, this was definitely a book worth owning. I love the way that Sarah writes. I took the photos 2 years ago while in England. Rousham House was the place that came to mind while I was reading, which is why I asked Sarah about inspiration. I wonder if that was one of the houses she visited. The best part of author interviews is being able to ask those questions. Tina, Hundreds Hall is a character in itself. I have personal reasons for asking all authors about the creative process, as you may have guessed. Tricia, yes, Sarah’s advice about patience was exactly what I needed to hear now. It’s hard to transition from a finished project to the rough draft of the next work in progress. Edith, thank you! That is so nice to hear. I’d love to hear how you think The Little Stranger fits in with her other work. The subject of her latest will definitely appeal to you. I would have been too young to enjoy that exhibit, but I’d love to see it now. Thanks for sharing! Alyssa, it was an unusual mix, but it worked. The book really felt like it was written during that time. I’m coming to read your review next. I just checked this book out from our library. I had come across a glowing review somewhere and ordered it for our popular reading collection. I also have John Irving's new book so I'm not sure which one I'll attempt first. I don't enjoy reading fiction as much as I used to but I'm going to try both of these. The Waters book in particular sounds like something I'd like. The book sounds great. And your photographs are beautiful. Phillip, I’ve heard mixed reviews of Irving’s latest although I haven’t read it myself. Cider House Rules was one of my favorite books ever. I think you’ll appreciate the research into historical detail in The Little Stranger. The story is obviously fiction but there is a strong sense of realism to it. I’d love to hear what you thought of it. Stacy, I enjoyed your book review too. Welcome to the book review club and my blog! As much as reading the book, I have enjoyed reading the lively discussions about this book online. There are many theories about what actually took place at Hundred Halls. Patti, that was a question I was tempted to ask the author, but I didn’t want a spoiler. My favorite aspect about the book was how she left that ambiguous. Thanks for telling us about the online discussions and your reaction. I enjoyed your book club review too. Yes, this is definitely on my list. I loved "Night Watch" and thought it captured the era beautifully. Also heart-breaking in some details. Ewix, you will love The Little Stranger. I’d be interested in your comparison of this book to Night Watch. Thanks for the recommendation. Thank-You for such a great review! This will be another book, I will have to buy. I am half way through-The Three Weissmanns of Westport and I love this book!! I will be sending you a personal e-mail-so please look for it Thursday. Tracy, glad to hear you are enjoying the last book I reviewed. You’ll enjoy this one too although it is slower paced. Both capture the English country novel sensibility. I’ll look forward to your email. This sounds like just the sort of novel I would love to read, Sarah! Thanks for introducing me to Sarah Waters. Like many Americans, I've always been fascinated by the aristocratic culture of the UK, but at the same time find it difficult to sympathize with characters who aren't used to having to "work" for a living. This novel sounds like an interesting look at this time period. Rose, this novel has your name written all over it. If you do read it, let me know what you think of it. I’m looking forward to reading your review next month. I have a really good book for next month too, The Poacher’s Son by Paul Doiron. Keri, thanks! I enjoyed your review too. This book sounds right up my alley! And, Sarah, you always have the best interview questions! Ooh, sounds very Pip and A Tale of Two Cities as far as the social class reactions go. What an interesting title. Barrie, you must read this book. I was thinking of your series as I read it. Thanks for hosting another book review club. Stacy, there is a Dickensian element to The Little Stranger. I can’t explain the title without a spoiler. You are sooo right about me enjoying this book! It was one of my favourites last year. In fact, I wrote about it myself.... (look for red riding hood and the wolf on my sidebar!) I have been meaning to pick up Fingersmith as well.... this has reminded me! And thanks for the sweet birthday wishes. I am just back from the beach.... with laundry.... and we had a wonderful time! Everyone should celebrate their birthdays by the sea, don't you think? Excellent interview! I liked how you interspersed photos from your sabbatical in England throughout your post. I had never heard of this book/author since I started book blogging but it really looks like one I must read! Pamela, welcome back, birthday girl! I just came back from walking by the sea myself. Thank for telling me about your fabulous review. Here’s the link for others: Pamela’s review of The Little Stranger. Booksnyc, thank you! From what I’ve seen of your reading tastes, I think you’ll love Sarah Waters. Come back and post a link comment if you review it. Lovely post. So much fun to hear about a new writer. And by the way, your blog looks great on the ipad. Cynthia, I think you’d appreciate Sarah Water’s descriptive detail and character development. I’d love to hear more about the ipad for blogging and reading books. Oh, I enjoyed this book! I read it here in the Netherlands, but will read it again when we move back to England this summer. JAPRA, I thought you'd appreciate Sarah Waters too. I have no words with which to thank you for this interview and review. I read my first Sarah Waters last year and I am planning to buy all her novels. I'm still away but doing a little blog round now. ACIL, wow: greetings to Kual Lumpur! I’m pleased to hear that you love Sarah Waters too. I’m interested in reading more of her work too. I hope you are having a wonderful vacation and that you will share it upon your return. Thanks for visiting! Nice complement to A Book A Week's review. I read the book last fall and, like you, was taken with the strong sense of the house and period; much less so by the paranormal aspects of the story. Thank you so much for a lovely review of Sarah Waters' new book! I've read her "Affinity" and "Fingersmith" before and found them quite interesting! Her novels sell very well in Japan too. I'd love to read her latest book which sounds so tempting!! Ms. Wis, yes, it was nice coincidence that A Book a Week, and I posted The Little Stranger reviews during the same week. We share a similar taste in books. Sapphire, that’s interesting that Sarah Waters translates well to Japanese since her writing is so British. Good writing steps beyond cultural boundaries. I’m not surprised that you are a fan. I've had this book on my to-read shelf for a while now, but your review has made it come alive for me. It will be my first read when I get back to England. When I was staying with my parents', I read an Elizabeth Buchnan book called Consider the Lily. It has many of the same elements: the old house, the crumbling aristocratic order, ghosts. I am a sucker for this kind of story. Your interview with Sarah Waters was a real treat. I will have to add that Phillipa Gregory to my list. Bee, I hope you’re back in the UK by now and not waiting in an airport. What a bother! I just got back from hiking with the kids. Nature was more accommodating. More on Wednesday. Thanks for the novel recommendation; I haven’t heard of it. I’ll be curious to hear your reaction to The Little Stranger. Just finished this novel and I loved it!! For me it was a bit Brideshead Revisited meets Hitchcock. A Taste for Books, nice analogy. Welcome to my blog!